The Royal LePage Award of Excellence (2012-2016) is awarded to agents who attain the Director’s Platinum or President’s Gold Award at least five out of seven previous consecutive years. 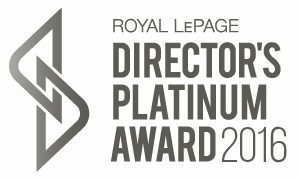 The Royal LePage Director’s Platinum Award (2011-2016) The threshold level required to attain the Director’s Platinum Award is the top 5% of each residential market’s sales representatives’ earnings. Earnings are defined as gross closed and collected commissions in the preceding year. Royal LePage Diamond Award: After only 4 1/2 years as a realtor, Eric was able to help enough buyers and sellers to achieve their goals that Royal LePage has presented him with this award. During 2010, Eric has become one of the top 3% of agents in each residential market’s sales. President’s Gold Award: Eric has been awarded this distinction since his second year in business in recognition of his professionalism (2007-2009). This is presented to Royal LePage agents who achieve the top 10% of their residential market’s sales representatives’ earnings.